This time of year is perfect for being thankful for friends, family and Arizona weather. We like to remember the best parts about being an Arizonan by throwing shout outs to the local organizations that make our communities unique. This holiday season, take advantage of these unique ways to shop local and give local to those on your gift list. You might meet new friends, discover a favorite hangout or find that perfect holiday gift! Give them the gift of being a localist! Local First Arizona (LFA) graciously outlined the best ways to stay local while shopping and painting the town. Learn how easy it is to support our homegrown businesses and keep revenue in Arizona. The LFA Localist program is another way to stay in the local loop with awesome events, mixers and deals. Annual memberships are a steal at $20. Everyone who is anyone is hip to the great things that LFA does for our state. Find out how you can join in, or give the gift of local, homegrown Arizona savings this Christmas! Discover local tastes all across Arizona! In Flagstaff, Firecreek Coffee puts their pine trees where their coffee is with the Ponderosa Vanilla Latte. In house, hand-crafted syrups include the aforementioned Ponderosa Pine, Salted Cardamom and Orange Lavender. In Phoenix, Rustler’s Rooste is nestled in the foothills of South Mountain and knows how to create a memorable dining experience. Upon arrival, guests are greeted by both a breathtaking view and a friendly live steer. The restaurant features a funhouse slide as an alternative to stairs. Mesa boasts the beloved Los Dos Molinos that features authentic New Mexican cuisine. May the tears of unadulterated spicy joy commence! In Tucson, check out Borderlands Brewing Company. As if their delicious food and tasty brews weren’t reason enough, we love Borderlands because of their environmentally conscious business model. Also in Tucson, Exo Coffee features slow, cold brewed coffee beans, sumptuous Mexican chocolate, and Sonoran native Chiltepín chiles in their out-of-this-world Chiltepín Toddy – a concoction sure to be mind-blowingly amazing. Here’s a family-game-night alternative! Volunteering can be one of the most rewarding pastimes of all. It’s a win/win endeavor. Established local charitable organizations in the Valley include St. Mary’s Food Bank who hosts holiday food drives and St. Vincent de Paul with annual support of families in need. In most cases, children are welcome to come and lend a helping hand too, but make sure to check with the organization. Why stop there? Families Giving Back is a great website for leads on ways to volunteer year-around. Your community will thank you and you’ll feel fulfilled this holiday season. The holiday season is a great time to spoil our loved ones, including those furry, feathery and scaly friends. Treat your own pets with goods from an Arizona based boutique like Noble Beast. This time of year is also perfect for reaching out to animals in need. Local animal welfare organizations pull out all the stops with great ways to give back to our fellow creatures. HALO Animal Rescue periodically waives all fees to adopt pit bull mixes as part of their Adopt-A-Bull program. The Arizona Animal Welfare League and SPCA does their part to create a world where there are no homeless dogs and cats. For more adorableness, check out one of their Bark Break events at Civic Space Park hosted by Downtown Phoenix Inc. and City of Phoenix Parks and Recreation Department. Spare the Turkey and Spoil Yourself. Speaking of kindness to animals, here’s your chance to omit them from your holiday feast. Local vegan restaurant and bakery, Green does holiday catering! Feast on a delicious multi-course gourmet meal and relish every turkey-free bite. Check out the “Nami” bakery next door for cookies, cakes and ice cream. Holiday pies are available to custom order. Herbivores and omnivores alike will swoon! 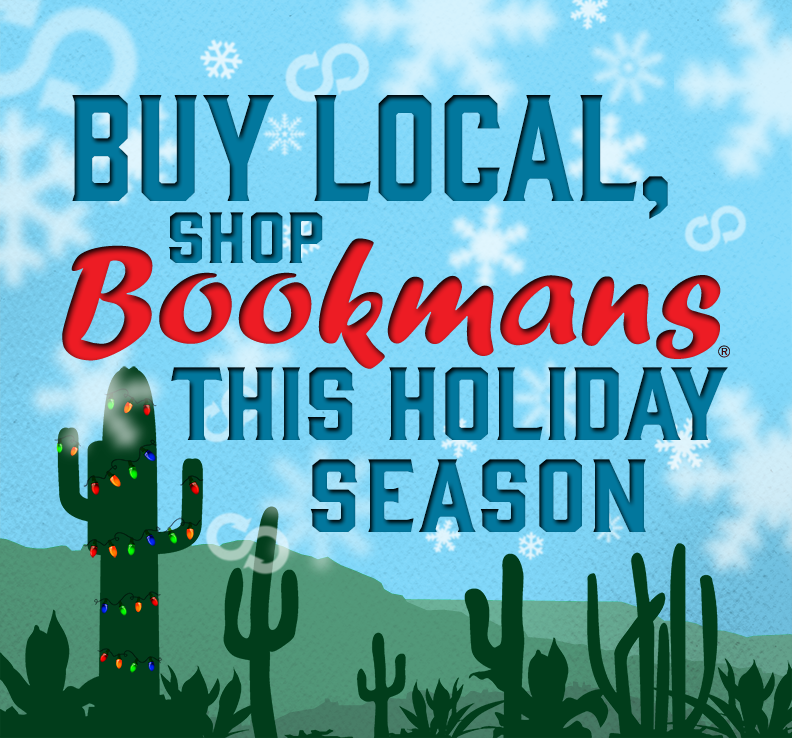 As a local business ourselves, Bookmans is excited for opportunities to partner with other Arizona-based businesses and organizations. Why true to our Shop Local, Give Local campaign all year, and just because it’s not November doesn’t mean we can’t join the cause and help us build an better community during the holidays. Be sure to check out our Events Calendar for more free events at all of our locations, and utilize this list of local gifts during your last minute gift shopping extravaganzas!